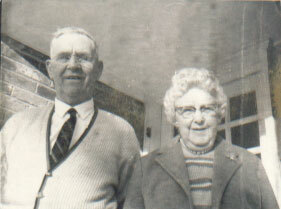 Albert and Gertrude in 1966. Albert Travers Thompson was born on the 19th day of May in 1894 on Kent Island in the state of Maryland. He married Gertrude Rena Bolling and together they had two children. He built boats at Trumpy's Boatyard in Edgewater, MD his whole life. At the time it was one of the premier producers of luxury wooden yachts. Albert was a member of the Sons of the American Revolution (SAR) and his grandchildren called him Pop-Pop. He died 19 July 1980 in Severna Park, MD, and, like his wife, was buried in Easton, MD. Minnie M (Miranda) Jones 1871 - ???? Howard Thompson 191? - 19?? Last Modified upon 30 June 2005 by Bradley James Wogsland.